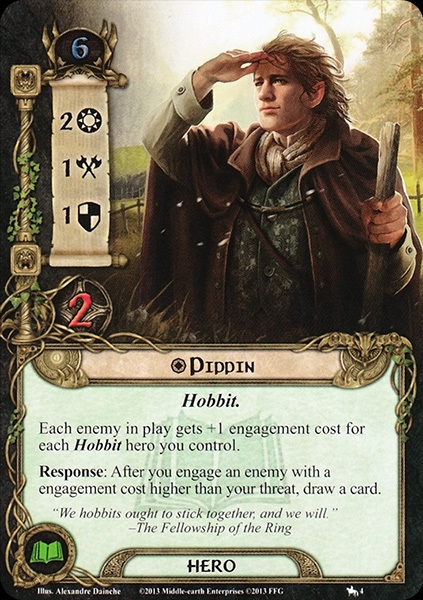 Peregrin 'Pippin' Took (Third Age 2990 - at least Fourth Age 63; 1390 - 1484 in Shire-reckoning, reaching at least 94-years-old) was one of the Hobbits in the Fellowship of the Ring. He was the youngest of the Company, being in his tweens, but grew up quickly and eventually became a Knight of Gondor. Elrond, at least, seemed to doubt his capability for the quest, but Pippin proved to be a loyal and courageous friend. In Buckland, they were joined by his kinsman Meriadoc Brandybuck and Fredegar Bolger. It was there that Frodo learned about his friends' “conspiracy” and that they did not intend to let him leave The Shire without them. They left the Shire to meet Gandalf in Bree. Pippin's enthusiasm to accompany Frodo is the result of his adventurous 'Tookish' nature as well as his loyalty and friendship to his cousin. When in Moria, Pippin incurred the wrath of Gandalf on two separate occasions: Pippin annoyed Gandalf with a foolish question while Gandalf was trying to open the West-gate of Moria; and, when inside Moria, Pippin's curiosity got the better of him as he dropped a stone down a well which lead to the the Fellowship hearing the drums in the deep - in doing so Pippin gained the retort, 'Fool of a Took!' from Gandalf. Merry and Pippin marched with the Ents to Isengard where the Ents killed the remaining servants of Saruman, filled the Ring of Isengard with water, and kept Saruman hostage in Orthanc. Whilst sitting on their 'field of victory', Merry and Pippin were reunited with Aragorn, Gandalf, Gimli and Legolas with whom they shared some pipe-weed and a meal. Denethor was amused with the Hobbit's manners, especially the way he spoke to him in a very informal and personalized familiar language, as with a close friend or social equal, since the Hobbitish dialect lacked formal forms. Denethor's servants were astonished to this view, and probably gave strength to the rumor that Pippin was of very high social rank within his own country, and soon a wild rumor circulated, that the 'Ernil i Pheriannath' had promised 5,000 Hobbits to the defense of the city. Peregrin - Tolkien's translation of Pippin's Westron name, and is derived from Latin and was used for people who wandered. The English word 'pilgrim' is derived from the same root. 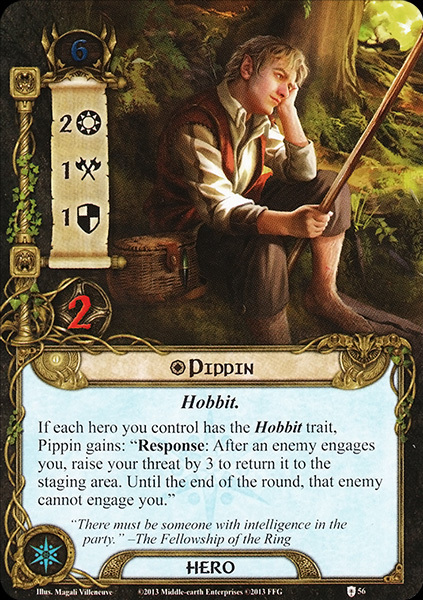 Pippin - a nickname most often used by Tolkien and fans alike. 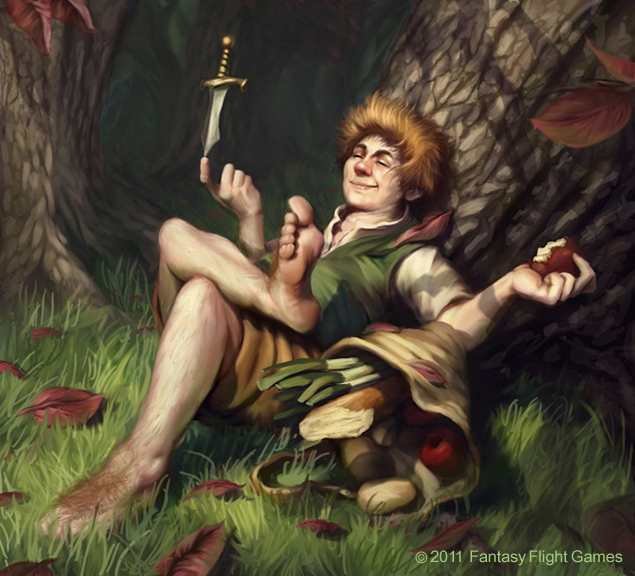 A 'pet-form' related to the Westron abbreviation Razar; pippin is a type of apple related to the word 'pip' - perhaps illustrating that Pippin was the youngest member of the Fellowship. Razanur Tûk - Peregrin's true Westron name, and contains the elements raza 'stranger', and razan 'foreign', and is the name of a legendary traveller. 'Fool of a Took' and 'Tom-fool of a Took' - given to him by Gandalf for his often mischievous behaviour, and, in particular, for dropping a stone down the well in Moria. Ernil i Pheriannath - Sindarin for 'Prince of the Halflings', a erroneous title given to Pippin by the people of Minas Tirith on the belief he must be of high importance to be travelling with Gandalf.